Already, we have boys who wear shoes that are too big for my feet. We have jeans in the laundry that I can’t imagine belong to any person once small enough to have grown inside me. We have wrestling in the backseat of the van that I dare not break up for fear of losing a limb. We have passionate discussions about sports in which I know better than to attempt to participate. The mother in me knows that these small changes are just a hint of the bigger ones to come — car keys and girlfriends and going-away to college. 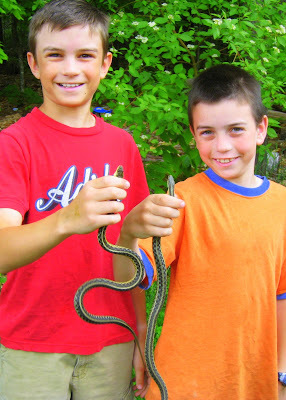 So today I am grateful for the sound of a young boy’s cry of “Snake!” I relish the fact that it does not fail to bring all of them stampeding outdoors to hunt. I cling to the whoops of victory that erupt from the gang of them as they seize their prey. And I savor the sight of them, dusty-faced in grubby T-shirts, beaming boyishly before me.